Regular, non-administrative users can change only their personal passwords, and all passwords are constrained by the IdM password policies. This allows administrators to create intro passwords or to reset passwords easily, while still keeping the final password confidential. Since any password sent by an administrator to the user is temporary, there is little security risk. 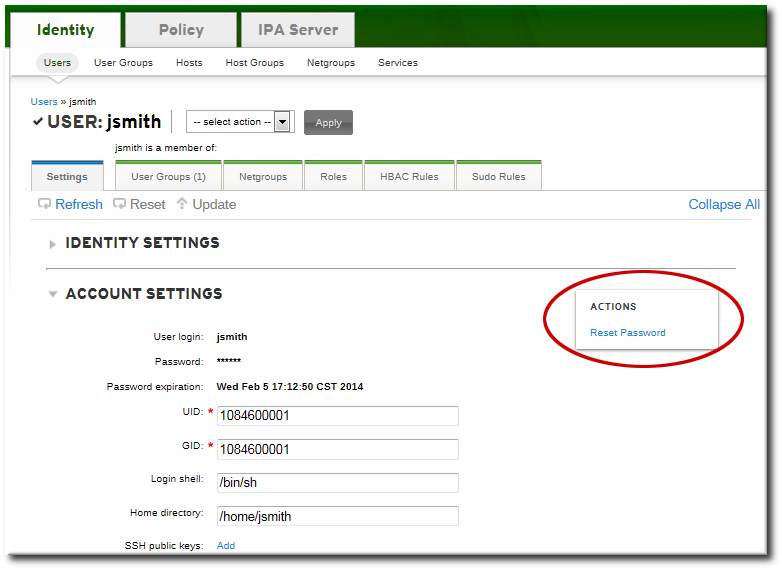 Changing a password as the IdM admin user overrides any IdM password policies, but the password expires immediately. This requires the user to change the password at the next login. Similarly, any user who has password change rights can change a password and no password policies are applied, but the other user must reset the password at the next login. Changing a password as the LDAP Directory Manager user, using LDAP tools, overrides any IdM password policies. Click the name of the user for whom to reset the password. All users can change their own password; only administrators or users with delegated permissions can change other user's passwords. Scroll to the Account Settings area. In the pop-up box, enter and confirm the new password. Changing a password — your own or another user's — is done using the user-mod command, as with other user account changes.